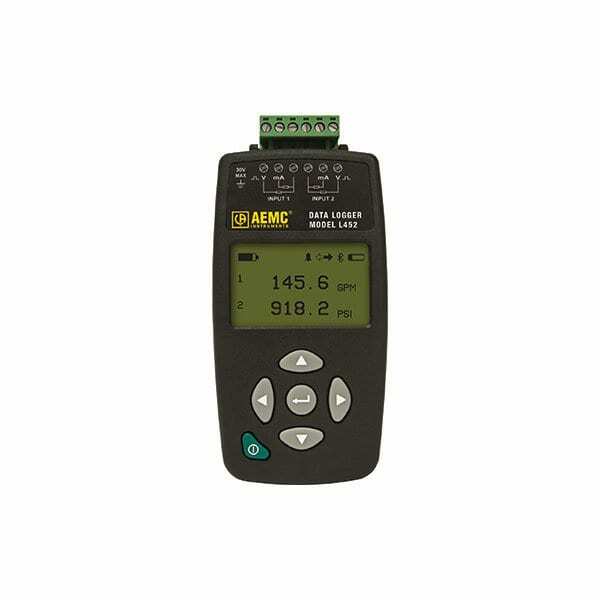 The AEMC L452 DC Voltage Current Data Logger is a low cost, simple to use, two-channel data logger. It records DC voltage, DC current, pulses, and events. Its two input channels allow the user to connect to various types of sensors in order to record data such as pressure, temperature, flow, humidity and more. This logger can also be used to record events such as machine run time. Each channel’s real-time measurement is displayed on the LCD screen. The L452 communicates via USB or Bluetooth for configuration and data transfer to a PC. The unit can also be configured using its front panel with a very simple user interface. The menus are multilingual. Users can lock the keypad within the DataView software. Alarms can be set for various measurements. DataView software for data storage, real-time display, analysis, and report generation from a pre-defined or custom template is included. Its ergonomics make it simple to use. It has a magnetized rear panel or optional wall mount holster and desktop stand which facilitate mounting. The L452 operates on rechargeable batteries or can be powered from the USB cable.